1. Check your local PBS listings to find when Heirloom Meals Thanksgiving Special is airing. 2. Potato and Turnip Gratin makes an excellent Thanksgiving side dish. 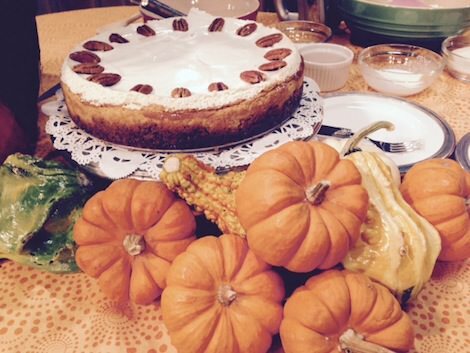 Carole shares her recipe on Connecticut Style. 3. Pumpkin Cheesecake is on the menu at our house. Here's the demo and recipe. 4. There are a couple of spots left in Carole's Italian Christmas Cookie workshop on December 7th. 5. Tune into Newschannel 13, Albany's NBC affiliate on Saturday November 22nd around 8:30-ish for Carole's Red Cabbage Gratin recipe. 6. Keep your eyes open for new radio shows - we've been remiss about getting them on the site but we have some goodies to share!